Rosemary remembers family stories about Monsignor, and went on to attend Saint Mary's College. They grew up in Saint John Neumann parish, another parish founded by the then Father Reynolds. He was such an integral part of their childhood faith formation. In fact, we thought Eric might have been baptized by him. He wasn't, but his sister might have been. Both boys went on to attend Notre Dame. Attended Sunday Mass and both had involved families at Saint Andrew. Caitlin's mom even worked for Monsignor Reynolds for some time at Saint Andrew. 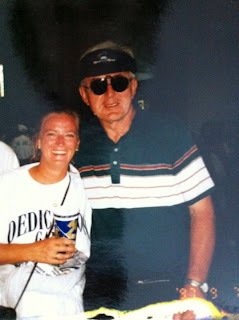 I know mom is welcoming Monsignor Reynolds into the Kingdom of Heaven today...ready to talk Notre Dame football again! Eternal rest grant unto him, o Lord. The Corsetti family also spent time at Saint Andrew at this time. I sponsored by brother when Monsignor Confirmed him. I remember sitting in his office for Advent confession and just being in awe of his simple faith and ability to love even strange little teenage kids! While Caitlin and I didn't know each other at the time, it is evident that Monsignors time at Saint Andrew was a blessing and life changing for both of our families. Sarah's family met Monsignor when they first moved to Saint Brigid / Roswell. Sarah parents were involved in the early planning and fundraising stages of the parish rectory, the last parish Monsignor called home. Sarah's mom worked in the wedding ministry for some time And Sarah was involved as a volunteer with the Life Teen program. Sarah's family also bonded with Monsignor over his love of Notre Dame, as Sarah attended Saint Mary's College with Caitlin and Rosemary. Eric bonded with him regularly over football, and I had the honor and blessing of working for Monsignor during his entire stay at Saint Brigid. 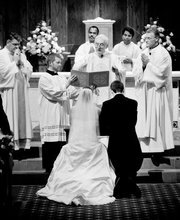 On October 10, 2009, Monsignor Reynolds married us. Over nearly three decades, the six of us have met and re-met a dozen times in countless ways and for numerous reasons. We're all friends through the years on our own and in groups. We've crossed paths and didn't even know it. Yet, on December 18, 2010 through Facebook posts and Twitter feeds we discovered how truly intimiate the Catholic family in Atlanta is, and how one man could have changed the faith lives of six friends in six unique ways at six points in time. Our meeting Monsignor Reynolds might have seemed random at the time, but today it is so clear how much God had His hand in our lives and how Monsignor's life was and is a witness to so many people. Monsignor Reynolds, we will all miss you so much. Thank you for your laugher, smile, kind heart, compliments on a job well done, and daily reminders not to worry but to stop and enjoy the simple things in life. And above all, thank you for your witness by LIVING everything you ever spoke or taught us. What a wonderful priest we were blessed with in our lives. Thank you for putting this together, E.
Msgr. Reynolds, pray for us!